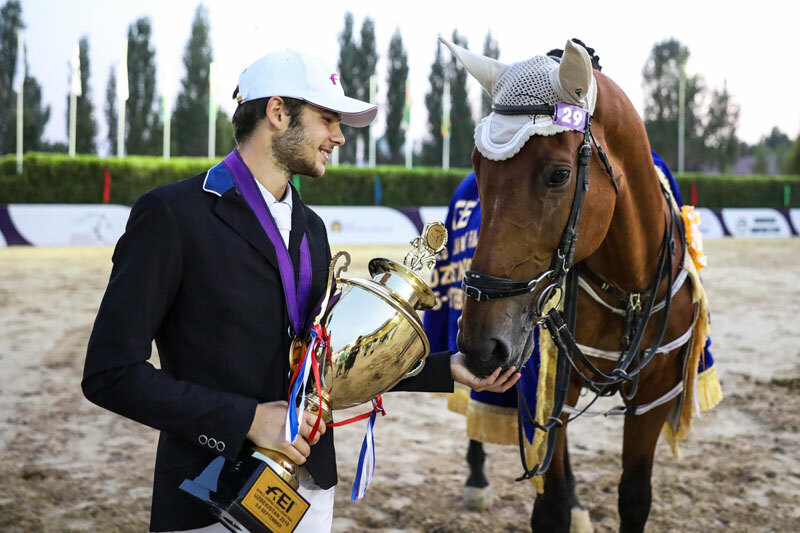 Israel’s Nadav Sternbach (18) scooped the FEI World Jumping Challenge Final 2018 title in a nail-biting jump-off in Tashkent (UZB). It came down to a head-to-head against Argentina’s Richard Kierkegaard (15), and there was little between the two of them in the end. “I came to just have fun, but this is really exciting,” said Sternbach, who left 19 competitors from 15 countries in his wake as he seized the crown at this 17th edition of the event which moved to Central Asia for the very first time this year. All the competing athletes qualified in 2017 when the Challenge was also used by 44 countries as the official qualifier for the 2018 Youth Olympic Games (YOG) in Buenos Aires (ARG). A total of 23 out of 30 athletes who are on the way to the YOG have made the cut through the Challenge series, and six of those used this weeks fixture as the perfect final run, because, just like at the YOG, the biggest test of all is that they must ride a horse they’ve never sat on before. The flags of Argentina, Bolivia, Ecuador, Egypt, Guatemala, India, Israel, Iran, Kyrgystan, Paraguay, Senegal, South Africa, Uzbekistan, Zambia and Zimbabwe all flew high as the Warm-up class got underway on Thursday when the host nation’s Abdushukur Sobirjonov (16) steered Rejayna into the winner’s enclosure. The age range of riders varied from 16 to 55, but it was the younger generation that dominated from start to finish, Turgunboev topping the line-up in Friday’s First Qualifier and Kyrgystan’s Kamil Sabitov, who turns 18 next week, pinning Guatemala’s Jose Ignacio Rosal (23) into runner-up spot in the Second Qualifier in which Sternbach finished third. There were nine starters in this morning’s Farewell class for those who didn’t make it through to this afternoon’s medal-decider, and victory went to Bolivia’s Gonzalo Bedoya Aguilar (18) who produced the only clear round with Coupette. There was great excitement when Hamoudi Kazoun (35), Senegal’s first-every entry for this event, finished second with just a single time penalty while the next two places went to Zimbabwe’s Brianagh Clark (17) and Zambia’s Anna Bunty Howard (16) whose next stop is the YOG. All 10 of those qualified for the Final started again on a zero score, but although five managed to stay clear in the first round, only Sternbach and Kierkegaard kept a clean sheet second time out over the course designed by Australia’s John Vallance. The hosts were already happy, because Turgunboev, riding Ambassador, had secured the third step of the podium for Uzbekistan before Kierkegaard led the way into the jump-off against the clock. And when he lowered the second fence, the young Argentinian, who claimed Children’s team gold at the FEI South American Championships in both 2015 and again in 2016, galloped on to put in the quickest possible time on the board. So, last into the arena, Sternbach knew that he had four faults in 64.8 seconds to beat. But his confidence took a major blow when he hit the very first fence. “I meant to go in and jump a slow, nice clear and then the fence fell – luckily it was number one so I had the time to catch up, but I was super-stressed trying to make it home as quick as I could,” said Sternbach after posting the faster time of 61.87 for the win. He knew he was fortunate to be partnered with the 15-year-old gelding, Aragon who is normally ridden by Uzbekistan’s Timus Sadikov. “He’s a really nice horse but it took a little bit of time to get used to him. In the Warm-up class we had 13 faults but that was a bit of a wake-up call and we got a lot better after that! He’s very strong and has a very big stride and the courses were built on short distances which was not to my advantage, but he’s a really good jumper and he’s very careful, and as the competition went on we connected really well. He really helped me, especially in that jump-off!” Sternbach said. FEI World Jumping Challenge Final 2018: Gold – Aragon (Nadav Sternbach) ISR 0/0 61.87; Silver – Ramiro (Richard Kierkegaard) ARG 0/0 64.8; Bronze – Ambassador (Saidamirkhon Turgenboev) UZB 0/1.